Kingfish, yellowtail, shark, grouper and snapper love it too! As a frozen product, Tournament Master® Chum is only available from bait and tackle shops and other retail outlets. Click on the regions below to find a distributor that can tell you which bait shops and retailers in your area carry Tournament Master® Chum in their freezers. Or ask your local tackle dealer to order through their distributor. 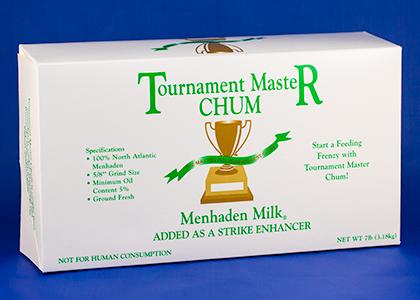 Why is Tournament Master® the number one selling chum in America? Consistent, premium quality for over 15 years. The process begins at the dock in northern Virginia. We use cold water menhaden that are larger and oilier than the southern pogies we are all familiar with. The fish are taken from the boat, loaded into an ice filled tanker and driven up the road to our plant. They pass through the grinder with any by-catch removed before grinding. Unique to our process, we add Menhaden Milk® during the grind which dramatically increases the scent profile of the chum. The ground menhaden is packed into our vapor barrier containers on a computerized scale so every package contains the exact weight stated on the label. The chum is quick frozen in our blast freezer then put in vapor barrier master cases and stored frozen until shipped to our distributors. Don’t risk the success of your next fishing trip by trying to save a couple bucks. Get Tournament Master® Chum, America’s Number One Selling Chum. Our 5/8″ grind Green Tournament Master® Chum is packaged in 7 lb. blocks, 2 gallon bucket (in a chum bag) or 30 lb. square bucket (with or without chum bag) and the new 25lb block. Always ground from fresh menhaden, never frozen. The Blue Tournament Master™ Chum double ground 1/4″ grind is available in 7 lb. blocks and excellent for both fishing for snapper, grouper and flounder, and excellent for keeping bait in top condtion in bait pens. Note that we recommend a fine mesh bag for this chum. See below for where to purchase. And see out Tips and Tricks page to learn more about chumming and Tournament Master® Chum. Tournament Master® Chum not available where you live? If you find Tournament Master® Chum isn’t available where you live, fill in the form below with your local tackle shop’s name, location, phone number and a contact person. We’ll make some inquiries and see what we can do. Of course give us your name and email address so we can get back to you. We'll do some research and get back with you as soon as possible.